I wrote this Attribute Generator to generate series of attributes, rather than copy … click … edit … copy …click … zzzz. As you can see I’m no UI expert. It ain’t pretty but it has saved me a lot of time over the years. The settings at the top-left are for generating ACNE-compatible attributes. It also generates in the correct order so you can bulk-select them and they will be in the correct order when you make a block of them. As you can see, I lost interest when it cam to making them different colours. LISP isn’t my favourite language but I’ve written (and butchered) a few routines that speed up my day. Quite a few of them are modified versions of the inbuilt ones (BX-BI is ATTOUT-ATTIN with a lot less clicks). I have far more sophisticated versions in the works. As it stands I have a ton of ideas logged in my FogBugz tracker and some of them are partially coded. I posted my survey to assess the viability of developing these with a lot more finesse to sell them, or should I just hack them together for myself? Please, let me know by taking my survey. Layers must be one of the most misnamed things in AutoCAD. The one thing that AutoCAD “Layers” don’t do is actually layer objects. This is controlled by the Draw Order commands. That’s what I mean when I say “Layers” are not layers. They are nothing at all like the olden-days concept of drafting on transparent paper and layering them on top of each other. AutoCAD “Layers” should be called Collections, or Bundles. They are a way of grouping objects (lines, blocks, text, whatever you like) together so you may easily adjust properties they share. The most obvious and prolific use is color. When you set the color property all of the objects on a “Layer” to “ByLayer” then you change the color of everything in that “Layer” simply by changing the color of the “Layer”. This is ultra-handy because it centralizes object properties you want to tweak, en masse. 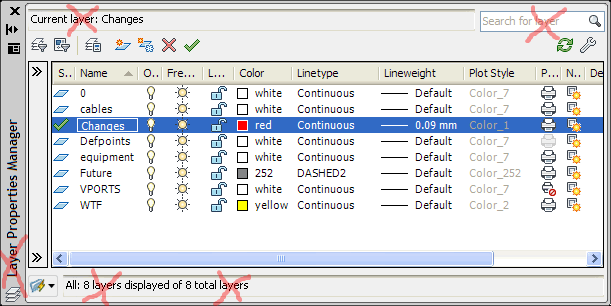 If you want to change the color of video cables in a drawing from blue to pink, you only need to change it in one place – on the Video “Layer” in the “Layer” manager. “Layers” also work inside blocks. Anything inside a block that is not on “Layer” 0 (zero) is a member of the “Layer” it is assigned to and will change along with everything else on that “Layer”. Layer 0 (zero) inside a block is a whole other topic. Before the end of 2015 I will be shipping tvCAD. Interested? 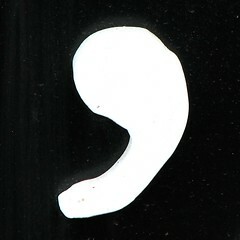 Please drop into http://www.tvcad.tv/ and I will keep you in the loop on its progress. There’s an email list there which will give you direct access to me and to the development process. Please, drop in, have your say and let’s make this happen. I dunno, perhaps AutoDesk are punishing you for buying the cheap version. Perhaps I am a bit too cynical about these things. That’s quite likely. You’ve just installed AutoCAD LT, opened your first drawing in it and gone to print it. “Missing or incompatible plot style” WTH? I thought that was one of the ones you get when you buy AutoCAD (LT). Does it cost extra? Gaaahhh! Here’s the issue – the “grown-ups” (full) version of AutoCAD, the one that makes Autodesk an obscene amount of money instead of just a lot, has a collection of plot styles whose names differ from the LT version that you have now just been punished for buying. For exampleinstance, the run-of-the-mill “Color-dependent Plot Style Table” in AutoCAD is called “acad.ctb” but the equivalent plot style in AutoCAD LT is called “acadlt.ctb”. Why? DO NOT ASK WHY !! There’s nothing to be gained from that. 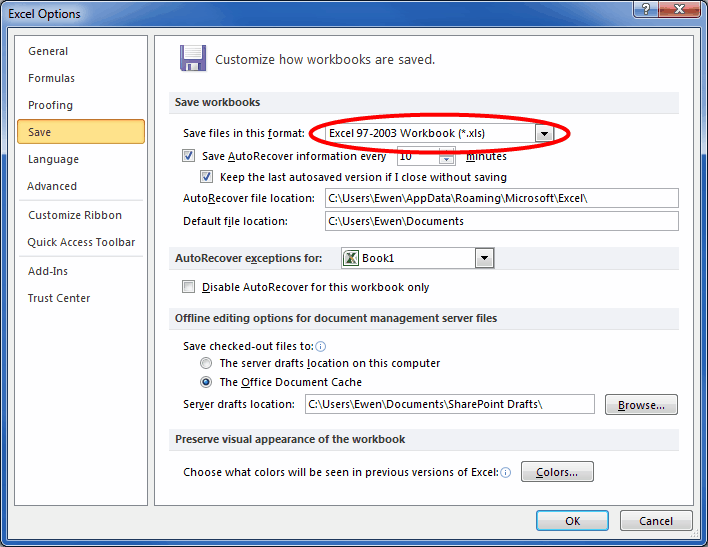 Plot settings, including the assigned plot-style, are saved in the drawing. Thus begins an ongoing plot-style tug-of-war between the Full version crowd and the LT crowd. You just backed your Ford into their BMW. The irony here is that the real fault lies with whoever designed the carpark (to continue the analogy). Solution: copy, and then rename the copies of all LT plot styles with “lt” at the end of their names. 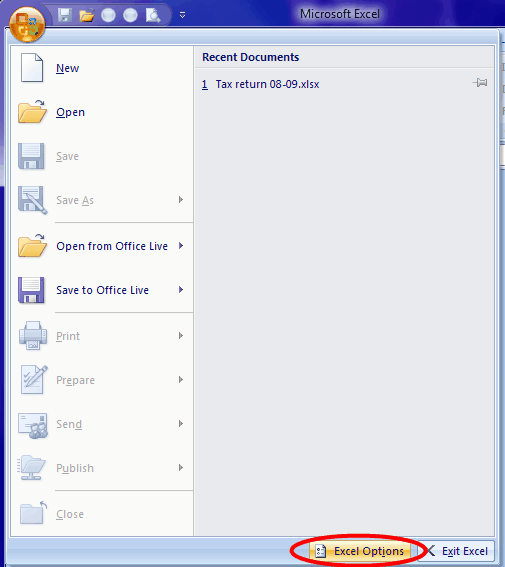 I much-prefer the Quick access toolbar to the ribbon. You could say it looks like a bit of a shell game to separate the two versions but, IMHO, it’s more likely due to Hanlon’s Razor. Either way, it’s a broken User Experience. You’re now pissed off for no good reason. Maybe the Full version and LT teams should do lunch or something, compare notes. We’re all on the same team, you know? Update in 2015 – it’s not a bug as such but a usability issue – as an aside the dot (period) wildcard matches any single non-alphanumeric character, similar to a question mark but much more restrictive. Curiously I would expect it to match a dot, which is does here. The cause of the confusion is still the lazy versus greedy aspect. This frustrated me so much over the years that I wrote a replacement for Find and Replace where you can be selective about what wildcards to use. Oh, and it lives in a tool palette so you don’t have to keep opening and closing a window. Check it out. So, why are they different? Initially, I thought the difference was that Excel’s search is greedy and AutoCAD’s search is an inconsistent mix of lazy and greedy. Here is an explanation of the difference between lazy and greedy text searching, as it pertains to using Regular Expressions. In a nutshell, a lazy search reckons it is done when it has found the bare minimum it needs to satisfy the requirements of the search. The * wildcard I used in the find section will match one or more of any character. A lazy search reckons it’s done when it matches one character, a greedy search will keep matching characters until it eventually runs our of ones that match the search string. In Excel’s case it stops when it gets to a dot, in AutoCAD it did that with the middle but not at the beginning and the end. The more I looked at it the more I realised that isn’t right. AutoCAD had actually ignored the first and last wildcards in the search. Instead of looking for *.*.*. * it has looked for .*.*. As Occam’s Razor inevitably predicts, it’s not as complex as I first thought – it’s simply somewhat broken. I’d say that’s a bug, folks. 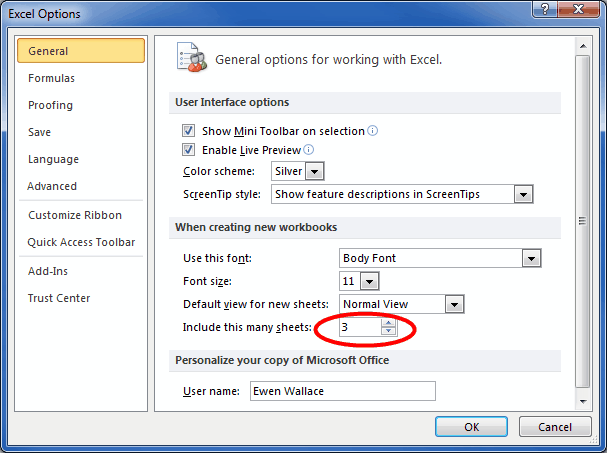 I guess I’ll be using ol’ faithful Excel for that find and replace exercise. Well, actually, it’s not that bad – the ? wildcard still works so I can use ???.???.???.??? in various number of ?’s to (eventually) get there. It’s still a bug, though. There are two parts to the Windows 7 and ACNE tale – installation and running. The crux of the matter is that you need to install and run ACNE as a Windows XP compatible application, primarily because ACNE was originally developed to run in Windows XP. Although Windows 7 is pretty good at eventually figuring this stuff out for itself, you’re always better off doing it properly and telling the operating system what is going on. 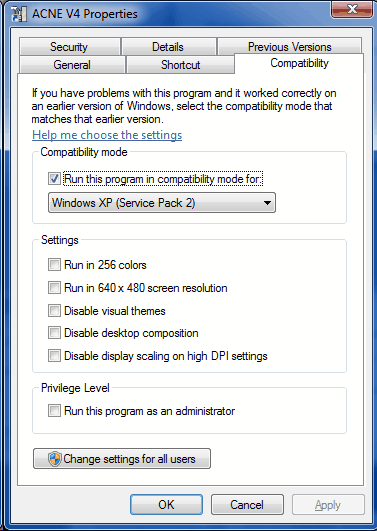 Right-click the installer file, click properties and then go to the compatibility tab.Set it to be compatible with Windows XP. I don’t think it really matters if you choose Service Pack 2 or 3 from the list. I chose Service Pack 2 because it was the current one when this version of the program was compiled. As this is an installer it will need to run with Administrator rights. It will trigger a UAC response when it installs – this is ok. Actually it’s great. UAC is great. Never turn it off. No, seriously. 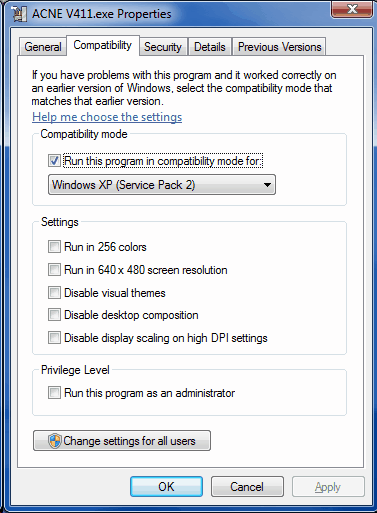 In Windows 7 To set ACNE to run in XP mode. Right-click the actual acne.exe file,click properties, compatibility & set to XP sp 2 or 3 mode. It doesn’t need to run as Administrator, which is good practice anyway. You should only run a program as Administrator if you desperately need to (ie. the installer, as above). It can make the difference between a program crashing-and-burning itself, or your whole computer. That should do it. If you have any questions, comments or tips, please feel free to add them here.